KELOWNA, B.C. - NDP Leader Adrian Dix took his campaign to a distillery in downtown Kelowna where he had a few drinks in a building that once housed a hardware store owned by British Columbia's former Social Credit premier W.A.C. Bennett. Okanagan Spirits chief executive officer Tyler Dyck served Dix on Sunday the distillery's award-winning blackcurrant liqueur, of which he took two sips. Not known as a regular drinker, Dix also sipped a whisky sour made from local Okanagan fruit. The visit to the Kelowna distillery coincided with Dix's agriculture-policy announcement in nearby Lake Country that included what he said were economic moves to improve access to markets by B.C. 's craft-distillery industry. The industry currently occupies less than one-half of one per cent of the province's total alcohol market. Dix said an NDP government will reduce the province's liquor markup to 129 per cent from 170 per cent and allow more sales options for craft products. The Liberals responded to Dix's distillery proposals with a statement, saying in the last year they have revised liquor policies to support B.C. breweries, wineries and distilleries by allowing more flexibility at live-event venues and permitting alcohol in movie theatres. The Liberals also changed liquor regulations to permit restaurant customers to bring their own wine into a licensed-dining establishment. 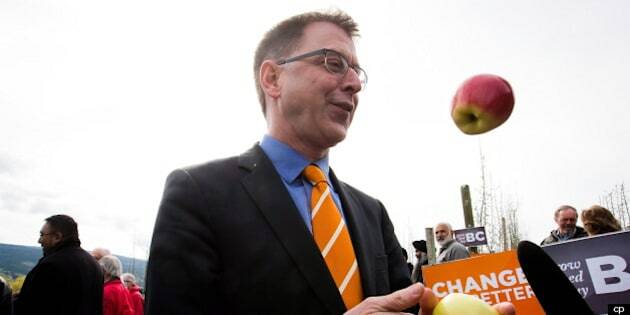 Earlier Sunday, Dix visited an apple orchard in the Okanagan riding of Liberal Agriculture Minister Norm Letnick to announce a $24-million plan to increase growth in the province's agriculture industry. Orchardists from the Okanagan handed out slices of locally grown Ambrosia apples to the gathering. Dix said the three-year program will add $8-million annually to the province's agriculture budget to help grow, feed and purchase B.C. products. Letnick said in a statement the Liberal budget provides increased supports for the agriculture sector, including an additional $4 million over three years to provide increased oversight for the Agricultural Land Commission. The commission seeks to preserve farmland in B.C. The budget also included $20 million in carbon-tax relief for farmers and greenhouse growers who consume fossil fuels to keep their operations going. Dix said Feed BC involves increasing the amount of locally grown foods served at B.C. hospitals, while Grow BC helps orchardists replant their orchards. "We know, you know that local food is good for you," said Dix. "We know, you know that the time that you need the best quality of food is when you are sick. "You know, we know that whether it's the Fraser Valley, or here in the Okanagan, we have some of the best agricultural land in the world and some of the most innovative farmers in the world." He said the NDP program will ensure B.C. hospitals increase their local food purchases. "Our short-term goal is to increase the level of local purchases by five per cent," said Dix, adding the Fraser Health authority in the Lower Mainland currently does not have a local-food policy for its hospitals. He said Buy BC, which seeks to promote B.C. food products, expands a B.C. fruit-and-food marketing program eliminated by the Liberals in 2001. Dix said he did not consider his plans to a subsidy. "It seems to me to make sense that when government buys food it should give priority to local food, as they do in many other jurisdiction, as they do in Washington state, we should do here," he said. B.C. Fruit Growers' Association president Jeet Dukhia said Dix's plans are a step forward for orchardists, especially the support for replanting and renewing orchards. He said the Liberals announced a similar $2-million plan last May, but an ongoing replanting initiative was not included in the February budget. "I don't say they cut it off, but it was not in the budget," he said. Dukhia said the replanting initiative will allow orchardists to experiment with new fruit products. He said it cost orchardists about $30,000 an acre to replant an orchard, but the long-term advantage is they can go from 100 tree per acre to 2,000 trees. The Liberals introduced a spend-o-meter clock Sunday to count what they say are $2 billion in spending promises being made by the Dix campaign. "One week into the campaign and all we've seen from Adrian Dix is how fast he can spend your money," said Finance Minister Mike de Jong in a statement. "And while the money is being spent very quickly, the NDP refuse to say how they'll pay for it all or even provide any details. They think it's their money, when it's really taxpayers' money."